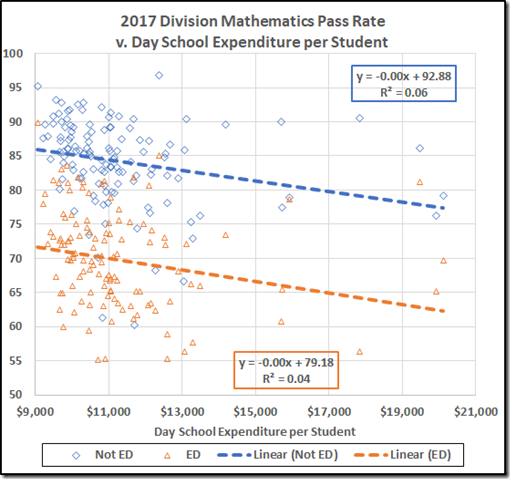 The notion of buying better schooling is easy to understand but there is precious little evidence that it works in practice. 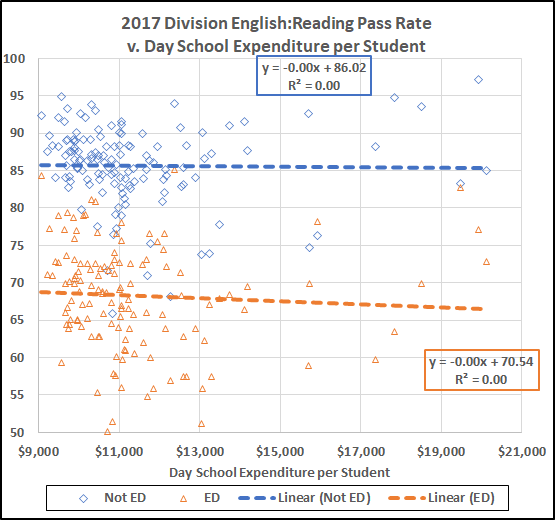 To the contrary, we have seen that the SOL pass rates in Virginia’s school divisions are quite unrelated to the divisions’ expenditures. 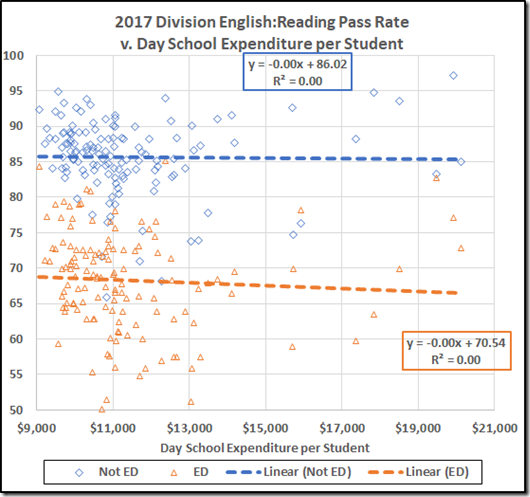 In the other direction, WashPost reports a study that found an effect of increased expenditures, suggesting that benefits were most obvious for students from poor families. 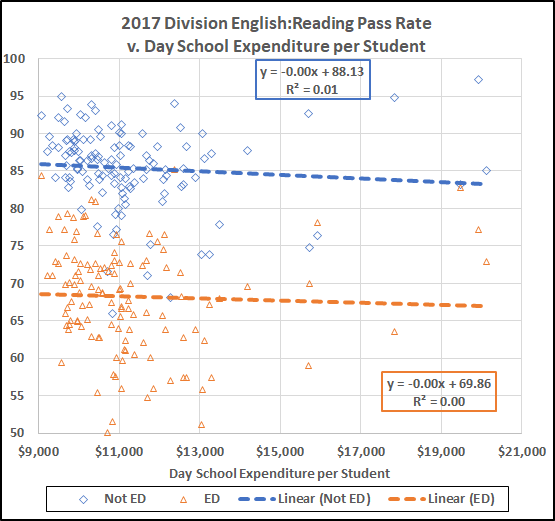 If larger expenditures indeed benefit less affluent students, the Virginia data should give us a yardstick: VDOE posts data for students who receive free and reduced price lunches. And the SOL pass rates provide a measure of what counts – output – not what’s easy to count – inputs. 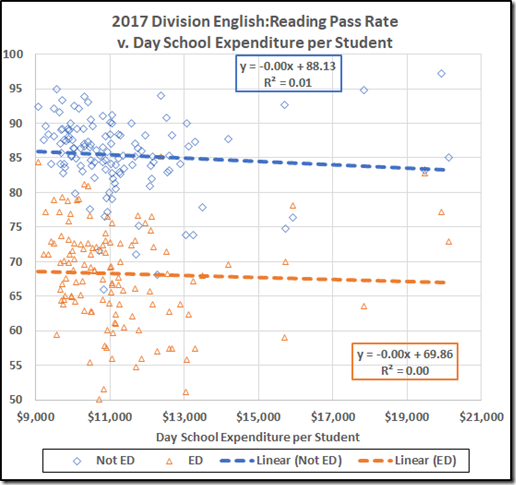 To start, here are the 2017 division average reading pass rates for students who are economically disadvantaged (“ED”) or are not (“Not ED”), plotted v. the division expenditure per student for the day school operation (We have to go back a year because the 2018 expenditure data are not yet up on the VDOE Web site). No correlation. Zip. Nada. 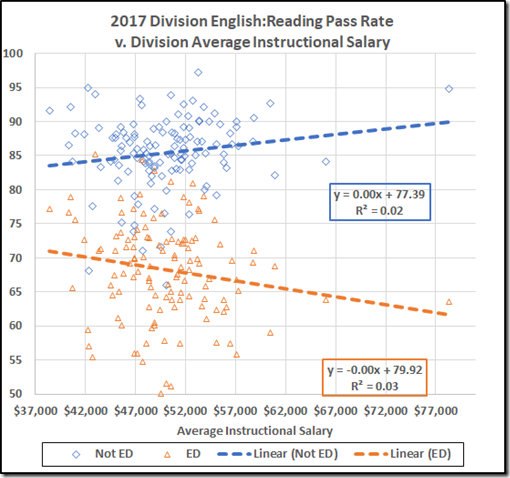 Whatever those expensive divisions are getting for their money, it’s not performance (by this measure), either of the ED or the Not ED students. 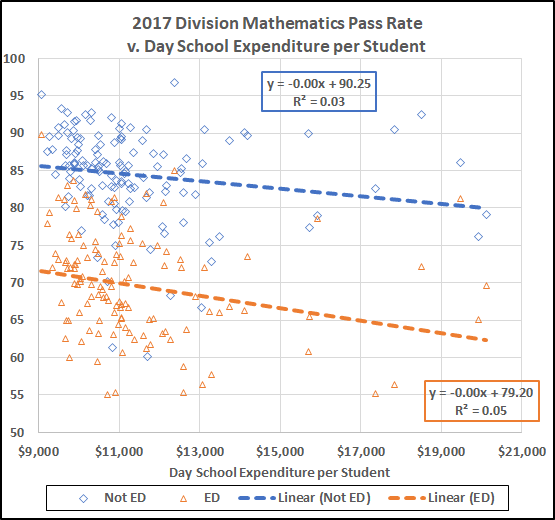 The math data might suggest that performance actually decreases with in increasing expenditures, but the R-squared values are much too small to draw any conclusions. 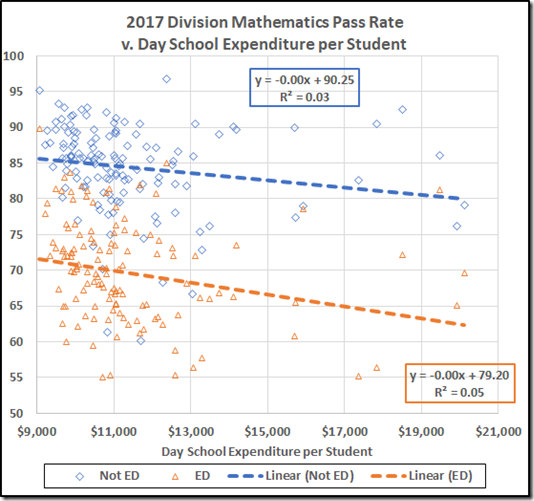 Of course, much of the the day school spending goes to administration, health services, transportation, and O&M, things that may or may not be related to students’ performance. 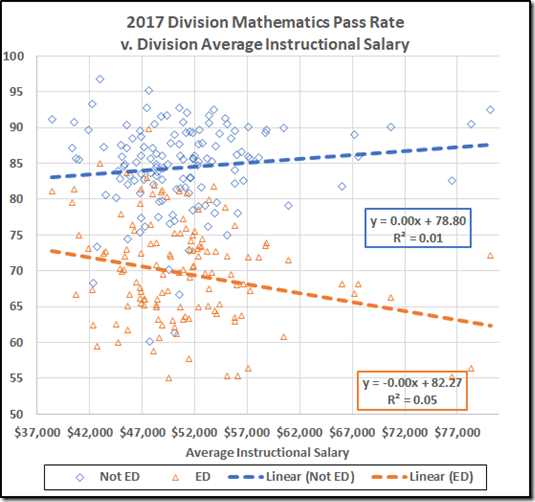 So let’s turn to salaries: Table 19 in the Superintendent’s Annual Report gives us the division average instructional salary. 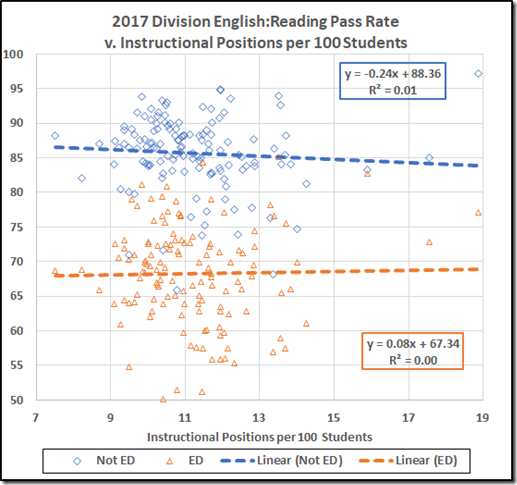 The reading data give mixed results but, again, not enough correlation to draw any conclusions. The math data sing the same song. 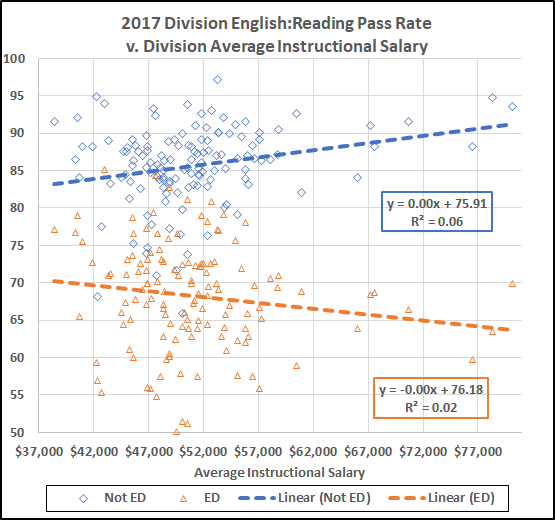 In sum: At least as to across-the-board salary averages, the divisions that pay more – up to over twice as much – don’t get better reading or math SOL pass rates. 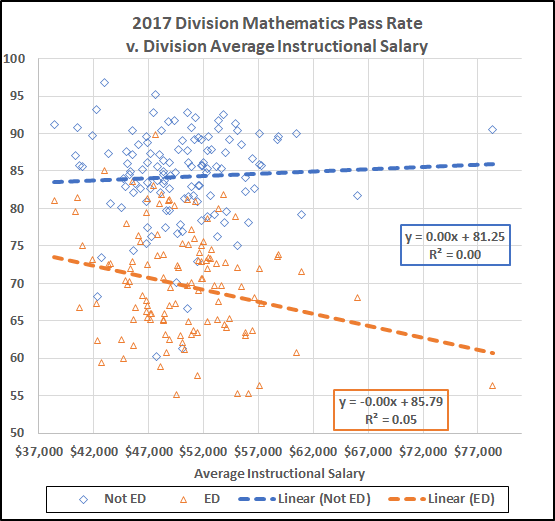 Yet the Governor says he wants to raise teacher pay. He does not tell us how that money might translate into better learning. Of course, he is a politician and he may have something other than learning in mind. 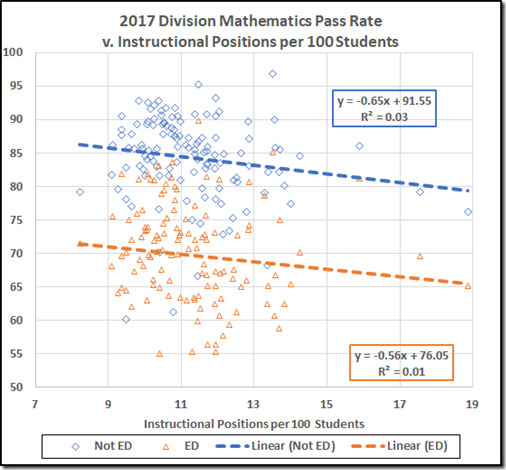 Class size is another popular consideration (again, however, a measure of inputs, not of learning). 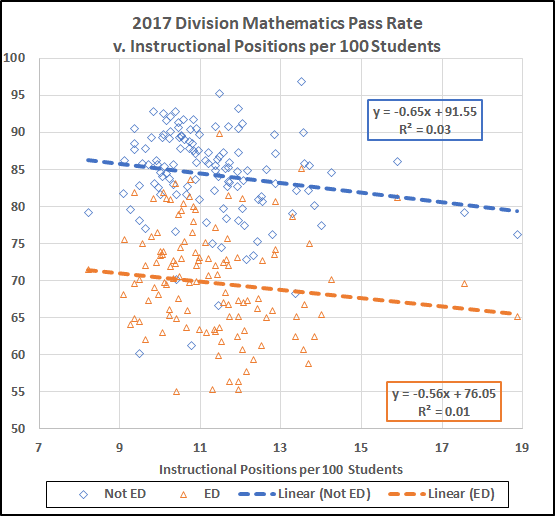 Table 17 gives us the number of instructional positions per thousand students; I’ve recalculated to number per hundred. 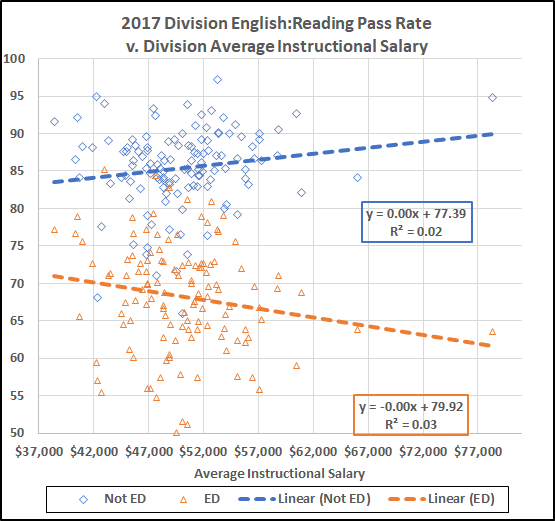 The salary range there covers a ratio of 2.75. 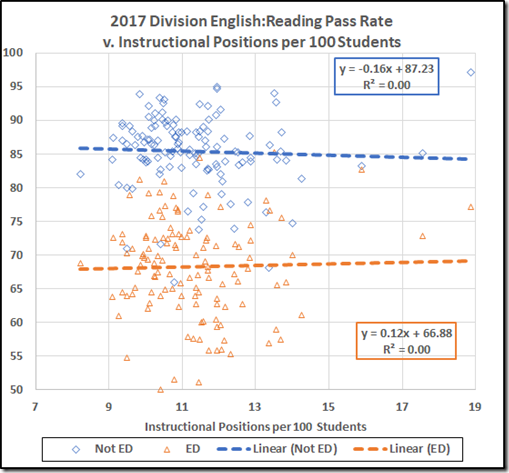 The performance does not correlate. 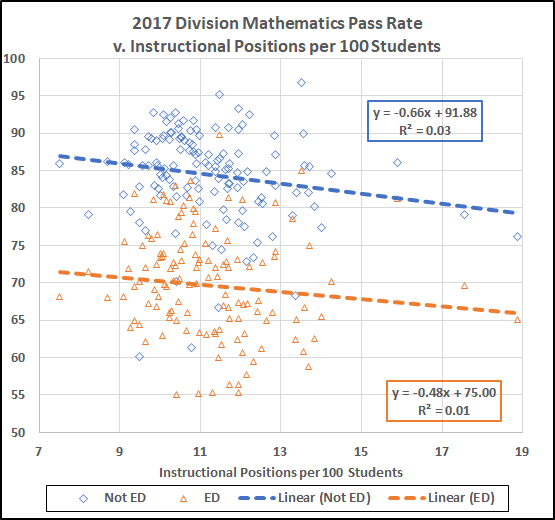 It is clear that, in terms of division averages, the per student expenditure, teacher salary, and number of teachers per student have no power to predict average SOL pass rates, either of ED or Not ED students. 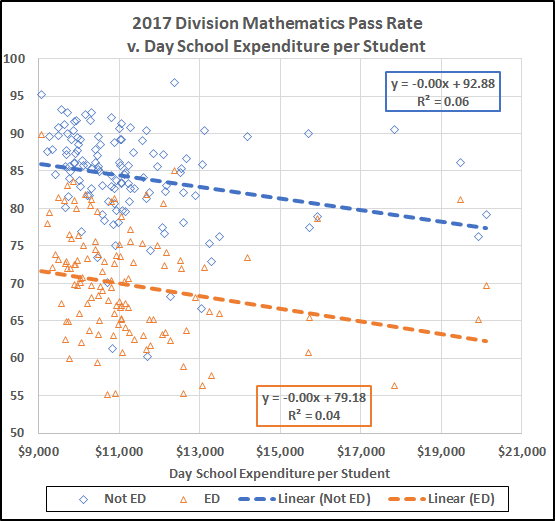 In light of that, it would be helpful for the marchers and other folks who want to spend more on schools to explain exactly how the additional funds they advocate would improve student performance and, for sure, how that effect would be measured. 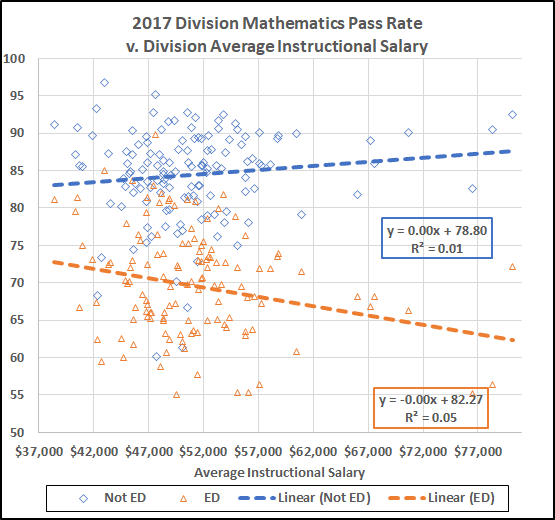 The estimable Jim Bacon points out that the large NoVa divisions might bias the data because of the high cost of living up there. 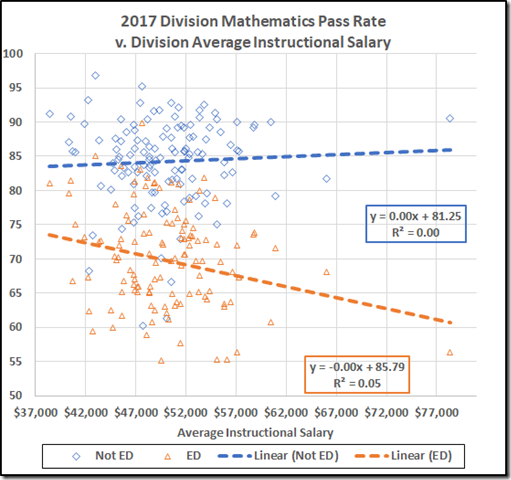 You might notice that the Big Guys disappear at the high salary end but mostly are down in the pack as to expenditure per student and positions per hundred. 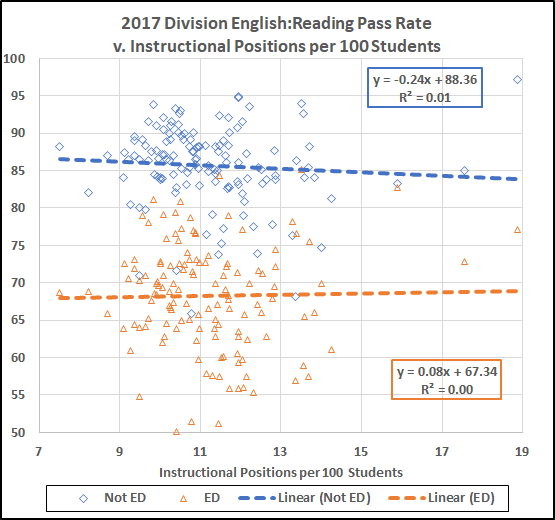 In any case, the data tell the same story without the NoVa divisions as with them. Time to Toughen the SOLs? 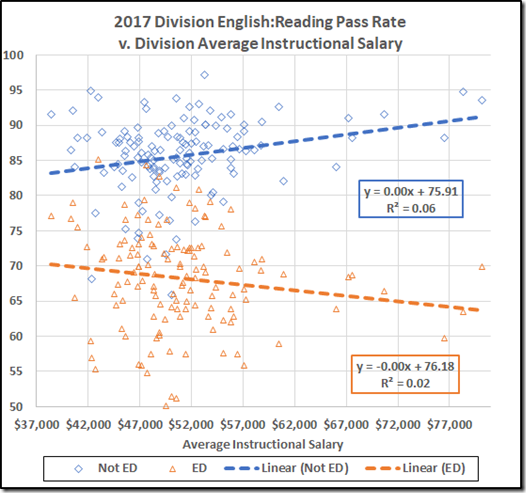 Why Do the New Tests Punish the Poorer Kids?